According to International Ergonomics Association, the study of ergonomics (or human factors) is concerned with the understanding of interactions among humans and other elements of a system. The term also applies to the profession that applies theory, principles, data and methods to design in order to optimize human well-being and overall system performance. According to the IEA, "Ergonomics helps harmonize things that interact with people in terms of people’s needs, abilities and limitations." Humans are complex creatures. We are designed to be mobile. However, much of our work requires sitting and even more of it requires us to be on a computer. We’re often sitting for hours on end, looking down at a device, rather than doing what our bodies are intended to do — move! We also prefer a pleasing environment that supports our psychological needs. Drab, uninspiring work environments do not promote productivity, and as a result, healthy workplace aesthetics are becoming the norm rather than a perk. Recognizing the need for human factors, companies are designing flexible workstations that provide employees with an opportunity to optimize their well-being. Our client Electro Rent designed their new headquarters with ergonomics in mind and was focused on comfort. 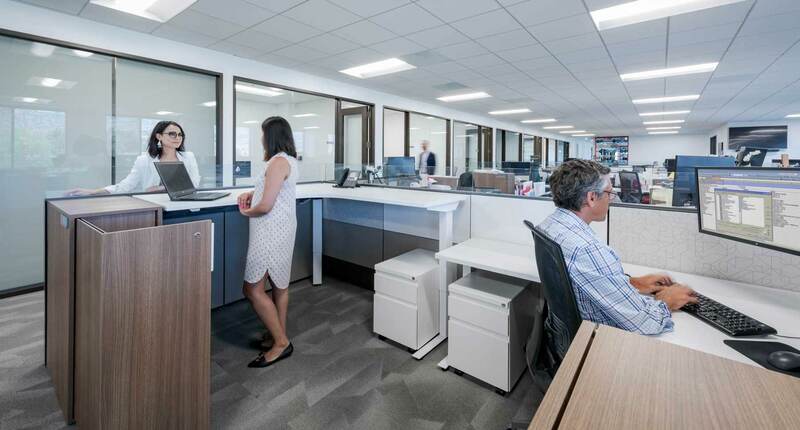 Employee workstations were outfitted with highly customizable chairs, adjustable height desks and monitor arms that could be tuned for optimal posture. Ergonomics is not just for workstations. As more companies move towards an agile office, they’re also implementing human factors in social and shared areas. The areas themselves provide employees an opportunity to “get up and move”. When furnished with lounge chairs and sofas that have proper lumbar support (what’s inside is as important as the looks), these human-centric spaces deliver on human well-being and performance. Attention to ergonomics can also be applied to lighting, desks accessories, phones and headsets, materials and acoustics, and pretty much everything in the modern office. New smart office technology—like lighting that adjusts according to conditions—is highly effective in supporting ergonomic programs. A human-centric workplace provides many benefits for employees that improve their well-being and produce a more satisfying work environment. The results for companies that prioritize ergonomics are many, including healthier staff, less employee turn-over, and higher productivity.